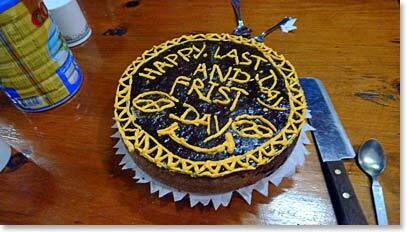 This is Leila Silveira with the last dispatch from our team. After breakfast, together with the Hanesbrands group in Lobuche, the group went down towards Pheriche on their way to Pangboche. They were really amazed by the fact that during the one hour it took to cross Pheriche, they saw five helicopters fly overhead. The team has been calling themselves "the burn victims" since the day they went to base camp; they all missed a few spots on their face, neck and behind the ears when they were putting on sunscreen that day and they got sunburnt. It is not dramatic but it is there and now Ljerka and Kerri are covering up with bandanas Arab style, under their baseball cap. Great solution. They also saw an interesting scene in Pheriche. A yak literally charged after a stray dog. I am quite sure that the dog must have been trying to play with the yak and the yak didn’t feel like the dog was an appropriate team player....well, who knows what goes through a yak's mind! 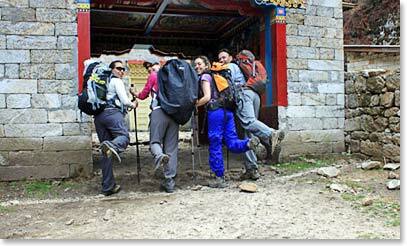 As they arrived in Pangboche, they were welcomed by the friendly face of Yangzing, Ang Temba’s wife. She had fresh mint tea ready and waiting for them, knowing that it is Kerri’s favourite drink and by now a favourite of everyone's. 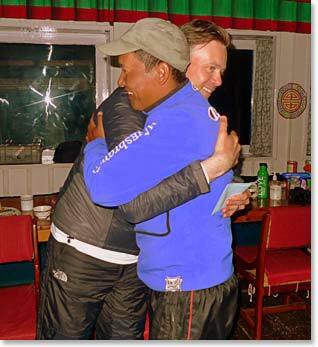 As they were leaving Pangboche, they all received a kata from Yangzing. A kata is a Tibetan prayer scarf, presented to honour guests. They really enjoyed the trail from Pangboche to Namche which was actually partially different than the one that they did on their way up. The last few hours, they traverse the valley and when the weather is nice, it is quite an amazing hike, probably one of the most beautiful of the entire trip. At this point, their main goal was to reach Namche and get to the bakery to enjoy their pizza again! They had lunch there and spent quite a few hours enjoying Namche before trekking down to Phakding where they met me and my second group. It was awesome to see them again. I found out that over the past few days Maya had stopped using a scarf or anything around her neck to protect her throat from the cold wind and she had developed a cough. I had to give her a hard time! But she was feeling better and Kerri was taking good care of her. We had a great farewell dinner, with lots of food as usual, and right after dinner Jeremy, Min and the girls started calling forward every member of our staff, complimenting them for such a great job, and giving them an envelope with tip money inside. It is always fun to watch this exchange: the members of the trekking groups rarely know some of our staff since their job is totally behind the scenes, running up and down the valley, making sure that everything is well taken care of before the groups arrive at the lodges or for lunch. 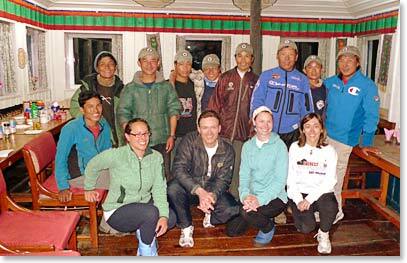 The next morning, the team left Phakding for Lukla around 9:30am, in no rush, with a short day ahead of them. Right after arriving in Lukla, it began to rain. What is there to do in Lukla on a rainy day? Go to Starbucks of course! Yes, Lukla has a Starbucks. I'm not so sure that it is the real thing, but the logo is the same, maybe even the coffee is the same. I'm not a good judge since I don’t drink coffee! The next morning everybody woke around 5am. I was worried that due to the unstable weather, they might get stuck in Lukla for an extra day. But they were on the first flight out, and just before they flew around 7am, they ran into Ang Temba, Berg Adventures operation manager, right on the airstrip with our next group. Only in Lukla do things like this happen. 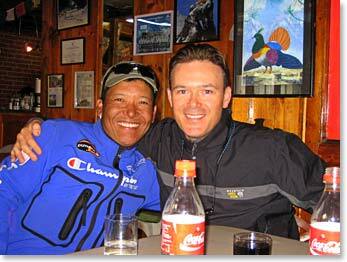 As I was walking around Namche, shopping and socializing, my cell phone rang and guess who it was: Jeremy. They wanted to let me know that they were safe back in Kathmandu, lounging by the Yak and Yeti swimming pool, ready for a swim and perhaps a drink. I have to say that it felt sort of unreal to be walking around this Sherpa village and talking on the cell phone with someone who was with me just 24 hours ago, but was now back to the comforts of a five-star hotel, and by the pool of all places. Well, I am happy that they are back safe and sound and soon will return back to their homes. Hopefully the Icelandic volcanoes won’t erupt again in the next few days, which would not allow for Jeremy and Ljerka to return to Geneva. Ljerka had already told me that if that was the case, she could probably work a few days in the United Nations Kathmandu office! I would like to finish this dispatch with a special thanks to Jeremy, Ljerka, Kerri and Maya (with her great big new Canon camera) for all the help and support they gave me in terms of photos for this trip. I can’t thank them enough since the photos are really a big help in describing the experience that we had, even though one really needs to be here to be able to fully understand and appreciate the Sherpa culture and the landscapes of Nepal. Mingma and Jeremy share a heartfelt hug. 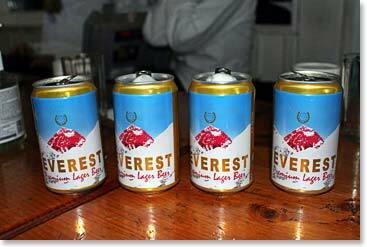 We cracked a few Everest Beers on our last night. 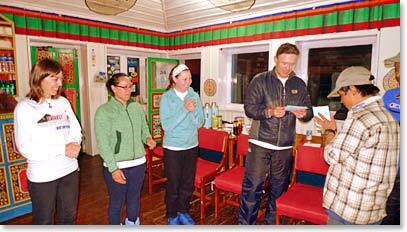 The group's farewell dinner coincided with the second group's first night in the Khumbu. 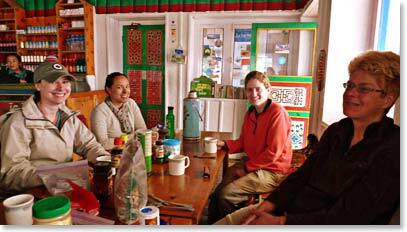 Maya and Kerri share some trekking advice with Chris and Marta, members of the next group to head to Everest Base Camp. 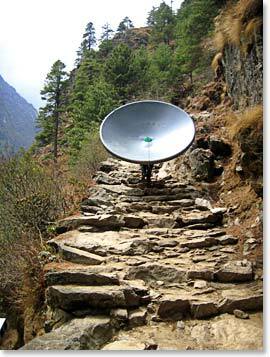 Some lucky Sherpa is getting satellite tv! The team is happy to be heading home after a great trip.